The version of the Apostles Creed recited today closely resembles the creed known as the Nicene Creed. 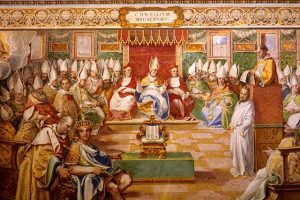 The Nicene Creed was formalized in 325AD at the First Council of Nicaea and amended in 381 AD at the First Council of Constantinople. 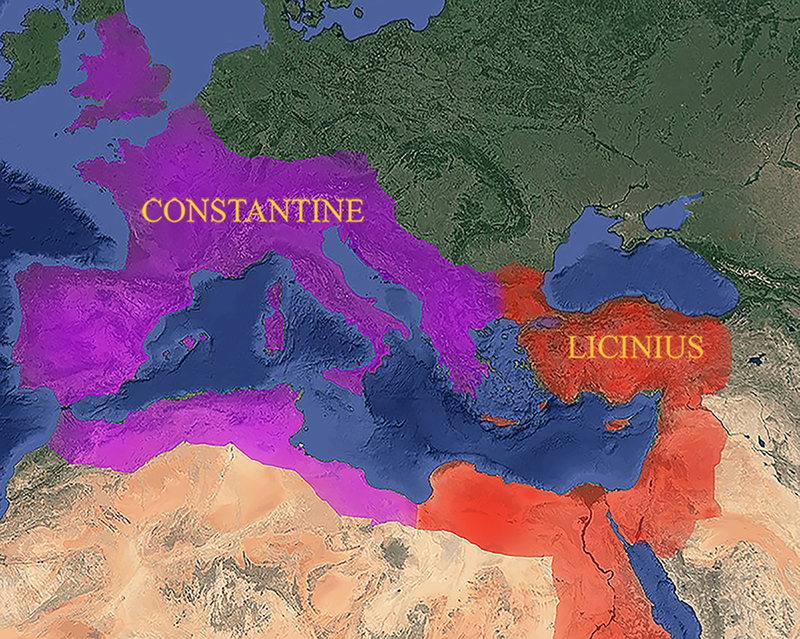 In 325 AD Constantine (the first) had just defeated Licinius and became the single ruler over the entire Roman Empire. After years of conflict, he wanted to bring unity to the empire which included unity in the religious beliefs. Don’t mistake Constantine’s desire for religious unity to be motivated by anything other than political power. The disagreements among different “Christian” religions were threatening to close the port in Alexandria. This closure would have had both economic and political consequences for Constantine. The primary disagreement between the so-called “Christian” religions was whether God and Jesus were one and the same or two different entities. Three hundred “Christian” bishops went to the town of Nicaea to establish what it meant to be a Christian. 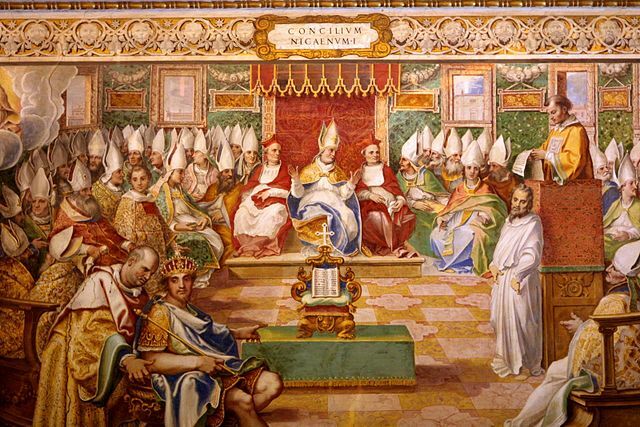 The Nicene Creed was formed after the month-long council hosted by Constantine. The wording specifically denied the Arian (not to be confused with Aryan) belief that Jesus and God were not the same entity. The Nicene Creed became the foundation for the Trinity concept in the current Apostles Creed. Where did these bishops get the idea of a trinity? The next step back is to Origen (c. 185-253), the “Christian” theologian that taught the “threefold” sense which is the threefold division of body, spirit and soul. He was a Platonist, those known for combining Greek and Christian religions. Remember Plato died in 347 BC, but his doctrines and philosophies continued on. Plato’s ideas are based on his own imagination and pagan worship practices from his time. They have nothing to do with God. Where did Plato get his ideas? The original idea of a trinity starts with the mother-son worship practices from Babylon. Specifically, a son was born of a spirit that was equivalent to God. Meet Tammuz, from which the Tau, T or cross symbol also originates. Tammuz was “immaculately” conceived by Semiramis. Horus was immaculately conceived by Isis. They are all the same. 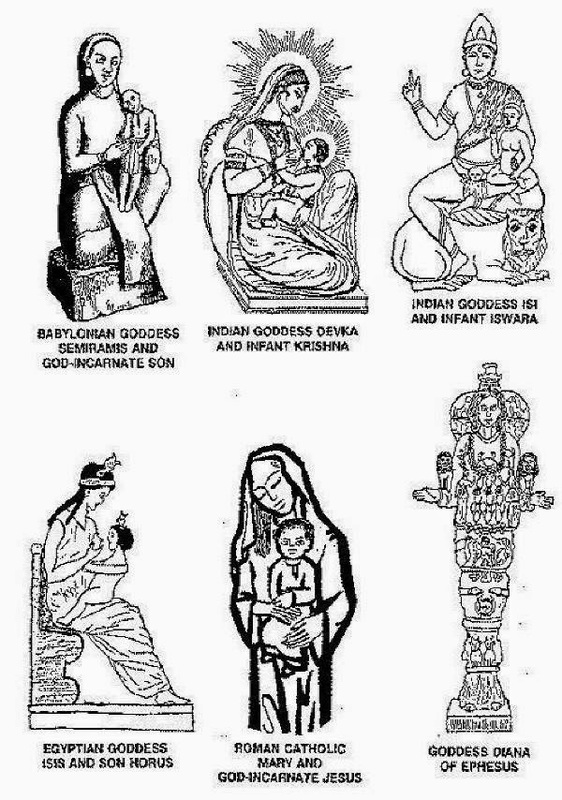 A picture speaks a thousand words and the following images are six different mother-son deities found around the world. They all originate from Babylon. Now, what about God? What is in God’s Word regarding this trinity? Many “Christians” will point to the following verse. But let’s look at this verse in the interlinear which gives the Strong’s numbers for each word. The <9999> under most of the words in this verse indicate that this was not part of the original text. These words are an insertion. The following excerpt clarifies the use of <9999>. These words were inserted by the same “Christians” that incorporated the idea of the Trinity into the “Apostles” creed. To see for yourself, check an online Bible with the Strong’s Concordance. Moving away from the Babylonians, Greeks and Romans, what about the Israelites, the Apostles? The teachings of Jesus and the Apostles refute the so-called Apostles Creed. In what way? That will be covered in the next article on this topic. Next Next post: Waiting for Rapture? You’re still here!